Iconoclasm is the deliberate destruction of religious icons or monuments, usually for religious or political motives. It is also a name given to the Christian "heresy" of the eighth and ninth centuries which caused a major controversy in the Eastern Roman Empire and provoked one of a series of schisms between Constantinople and Rome. People who engage in or support iconoclasm are called iconoclasts, a term that has come to be applied figuratively to any person who breaks or disdains established dogma or conventions. Conversely, people who revere or venerate religious images are called "iconodules" or "iconophiles"—or sometimes "idolators" by their opponents. 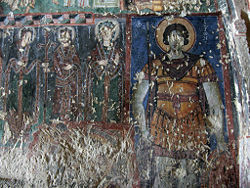 Iconoclasm may be carried out by people of one religion against the icons of another faith, as was the case with the early Israelite policy against Canaanite religion, as well as the Christian policy against the symbols of Roman paganism, and Muslim actions against both Christian and pagan images. However, iconoclasm is often the result of sectarian disputes between factions of the same religion. In Christian history, there were two major outbreaks of iconoclasm in the eighth and ninth century Byzantine Empire. Later, important episodes of Christian iconoclasm took place during the Protestant Reformation. Iconoclasm was also evident during the secular movements of the French Revolution and both during and after the Communist revolts of Russia and China. In common parlance, an iconoclast is a person who challenges cherished beliefs or traditional institutions as being based on error or superstition. The most famous iconoclastic episode of the Bible is the incident of the Golden Calf, in which Moses led the destruction of the image (Exodus 32) which the Israelites had constructed while Moses was on Mount Sinai (Ex. 32:5). "Do not make idols or set up an image or a sacred stone for yourselves, and do not place a carved stone in your land to bow down before it" (Leviticus 26:1). "Drive out all the inhabitants of the land before you. Destroy all their carved images and their cast idols, and demolish all their high places" (Numbers 33:52). "The images of their gods you are to burn in the fire. Do not covet the silver and gold on them, and do not take it for yourselves, or you will be ensnared by it, for it is detestable to the Lord your God" (Deuteronomy 7:25). Later biblical examples of iconoclasm were of two types: Destruction of altars and statues devoted to pagan gods, and the destruction of Israelite pillars, statues, and other images honoring Yahweh. Judean kings were praised by the biblical authors for destroying Canaanite idols and dismantling Israelite altars at the high places, since the Temple of Jerusalem was considered the only authorized place of sacrifice. In the northern kingdom of Israel, the usurper king Jehu won acclaim for destroying the temple and altar of Baal in the capital city of Samaria, but tolerated the golden calves dedicated to Yahweh at Bethel and Dan, for which he was criticized by the writers of the Books of Kings. King Hezekiah of Judah even destroyed the bronze snake which Moses had constructed at God's command to heal the Israelites in the wilderness (Numbers 21: 5-9, 2 Kings 18:4). The greatest iconoclast in biblical history was King Josiah of Judah (late seventh century B.C.E. ), who finally destroyed the altar at Bethel which even Jehu had spared and also instituted a campaign to destroy both pagan and Yahwist shrines everywhere in his realm except within the Temple of Jerusalem. For his iconoclastic zeal, Josiah would be hailed as the greatest king since David. Since the earliest Christians were also Jews, the tradition of the early church did not involve the use of icons. Indeed, many Christians went to their deaths rather than offer incense to the images of Roman gods, and even eating food sacrificed in pagan temples was prohibited for early Christians. Acts 19 tells the story of how the idol makers of Ephesus feared that the preaching of the Apostle Paul would result in damage to their trade in images of Diana/Artemis. As Christianity evolved away from its Jewish roots, however, it gradually began incorporating "pagan" traditions such as venerating icons of Jesus and Mary, while still abhorring images of pagan deities. By the third century C.E., Christian icons are much in evidence. After Christianity became the favored religion of the state in the fourth century, pagan temples, statues, and other icons were not safe from Christian attacks. Many of the defaced or beheaded statues of Greek and Roman art known today were the product of Christian iconoclasm. The Temple of Artemis at Ephesus, one of the Seven Wonders of the World, was one of many pagan and Jewish buildings which would soon be destroyed by Christian violence, both official and mob-related. As Christianity spread in pagan Europe, missionaries like Saint Boniface saw themselves as modern-day prophets called by God to confront paganism by destroying native shrines and sacred groves. Christian iconography, meanwhile, blossomed into a major art form. In contrast to Christianity, Islam adopted a strict policy against visual portrayals of God, biblical figures, and saints. One of the most famous acts of the prophet Muhammad was to destroy a pagan Arabic idols housed at the Kaaba in Mecca in 630. Muslim respect for Christians and Jews as "people of the Book," however, resulted in the protection of places of Christian worship, and thus a degree of toleration for Christian iconography existed. Although conquering Muslim armies sometimes desecrated Christian shrines, most Christians under Muslim rule continued to produce icons and to decorate their churches as they wished. A major exception to this pattern of tolerance was the Edict of Yazīd, issued by the Umayyad Caliph Yazid II in 722-723. This decree ordered the destruction of crosses and Christian images within the territory of the caliphate. However, Yazīd's iconoclastic policies were not maintained by his successors, and the production of icons by the Christian communities of the Levant continued without significant interruption from the sixth century to the ninth. The iconoclastic period in Byzantine Christian history came on the foundation of early Islamic iconoclasm, to which it was in part a reaction. It spawned one of the most contentious theological conflicts in Christian history. As with other doctrinal issues in the Byzantine period, the controversy over iconoclasm was by no means restricted to the clergy, or to arguments over theology. The continuing cultural confrontation with Islam and the military threat from the expanding Muslim empire created substantial opposition to the use of icons among certain factions of the people and the Christian bishops, especially in the Eastern Roman Empire. Some of these adopted the belief that icons were offensive to God, and/or that it bolstered the arguments of Muslims and Jews that their religion adhered more closely to God's will than Christianity did. Some refugees from the provinces taken over by the Muslims seem to have introduced iconoclastic ideas into the popular piety of the day, including notably among soldiers. In 695, Emperor Justinian II put a full-face image of Christ on the obverse of his gold coins. This "graven image" apparently caused the Muslim Caliph Abd al-Malik to break permanently with his previous adoption of Byzantine coin types, instituting a purely Islamic coinage with lettering only. Patriarch Germanus I of Constantinople wrote in the early eighth century that "now whole towns and multitudes of people are in considerable agitation over this matter." These attitudes were soon to reach the imperial court itself. Sometime between 726 and 730 the Byzantine Emperor Leo III Isaurian (reigned 717-741) ordered the removal of an image of Jesus prominently placed over the palace gate of Constantinople. Sources indicate that part of the reason for the removal was the military reversals suffered by Leo against Muslim forces and the eruption of the volcanic island of Thera, which Leo came to see as evidence of the wrath of God in reaction against Christian idolatry. Some of those assigned to the removal of the icon were killed by a group opposed to this action, known as iconodules (lovers of icons). Undeterred, Leo forbade the worship of religious images in an edict 730. His agents confiscated much church property, including not only icons and statues that were objects of veneration, but also valuable plate, candlesticks, altar cloths, and reliquaries that were decorated with religious figures. The edict did not apply to the creation of non-religious art, including the image of the emperor on coins, or to religious symbols that did not portray holy persons, such as the Cross without the image of Christ upon it. Patriarch Germanus I opposed the ban on the grounds that it surrendered to the false theological arguments of the Jews and Muslims regarding the use of religious images. Sources differ as to whether his subsequent removal from office was due to being deposed by Leo or resigning in protest. In the West, Pope Gregory III held two synods at Rome which condemned Leo's actions, resulting in another of a long series of schisms between Rome and Constantinople. Leo retaliated by seizing certain lands under the pope's jurisdiction. If anyone ventures to represent the divine image of the Word after the Incarnation with material colors, let him be anathema! If anyone shall endeavor to represent the forms of the saints in lifeless pictures with material colors which are of no value (for this notion is vain and introduced by the devil)… let him be anathema! Icon of the "second" Seventh Ecumenical Council (Novodevichy Convent, Moscow). In this period complex theological arguments appeared, both for and against the use of icons. The monasteries were often strongholds of icon veneration. An underground network of anti-iconoclasts was organized among monks. The Syrian monk John of Damascus became the major opponent of iconoclasm through his theological writings. Another leading iconodule was Theodore the Studite. In reaction to monastic opposition to his policy, Constantine V moved against the monasteries, had relics thrown into the sea, and banned even the verbal invocation of saints. His son, Leo IV (775-80) was less rigorous in his iconoclastic policy and attempted to conciliate the factions. Near the end of his life, however, he took severe measures against images and reportedly was about to put away his secretly iconodule wife, Empress Irene, were it not for his death. Irene then took power as regent for her son, Constantine VI (780-97). The Byzantine Empress Irene ended the first iconloclastic period. With Irene's ascension as regent, the first iconoclastic period would come to an end. She initiated a new ecumenical council, ultimately called the Second Council of Nicaea, which first met in Constantinople in 786, but was disrupted by pro-iconoclast military units. It convened again at Nicea in 787, to reverse the decrees of the previous Iconoclast Council held at Constantinople and Hieria, appropriating its title as the Seventh Ecumenical Council. The decrees of this council, unlike those of the Iconoclast Council, were supported by the papacy. Ironically, however, Pope Leo III refused to recognize Irene's regency and used the opportunity of her reign to anoint Charlemagne as Holy Roman Emperor instead. Eastern Orthodoxy today considers the "second" Seventh Ecumenical Council the last genuine ecumenical council. Icon veneration in the Eastern Roman Empire lasted through the reign of Empress Irene's successor, Nicephorus I (reigned 802-811), and the two brief reigns after his. Emperor Leo V (reigned 813–820) instituted a second period of iconoclasm in 813, possibly moved in part, like his namesake Leo the Isaurian, by military failures which he saw as indicative of divine displeasure. Leo was succeeded by Michael II, who confirmed the decrees of the Iconoclast Council of 754. Michael II's 824 letter to Louis the Pious laments the tradition of image veneration, as well as such practices as treating icons as baptismal godfathers to infants. Michael was succeeded by his son, Theophilus, who, when he died, left his wife Theodora regent for his minor heir, Michael III. Like Irene 50 years before her, Theodora sought support from the iconodule monks and bishops, and proclaimed the restoration of icons in 843. Since that time, the first Sunday of Lent is celebrated in the churches of the Orthodox tradition as the feast of the "Triumph of Orthodoxy." 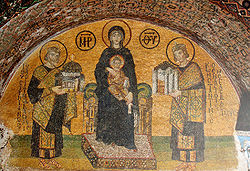 Recently rediscovered icon of the Virgin Mary, originally displayed at one of the entrances of the Hagia Sophia. Muslim armies sometimes destroyed both pagan and Christian icons and other art. Despite a religious prohibition against destroying Christian and Jewish houses of worship, temples or houses of worship were converted into mosques. A prominent example is Hagia Sophia in Istanbul (formerly Constantinople), which was converted into a mosque in 1453. Most of its icons were either desecrated or covered with plaster. 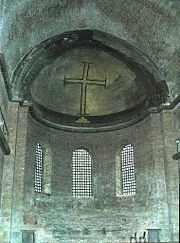 In the 1920s, Hagia Sophia was converted to a museum, and the restoration of its mosaics was undertaken by the American Byzantine Institute beginning in 1932. More dramatic cases of iconoclasm by Muslims are found in parts of India where Hindu and Buddhist temples were razed and mosques erected in their place (for example, the Qutub Complex). 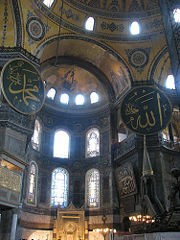 Islamic art in the Hagia Sophia. The church was transformed into a mosque and is now a museum. Some of the plastered-over Christian mosaics have now been uncovered. In the modern and contemporary periods, certain Muslim denominations continue to pursue iconoclastic agendas aimed at fellow Muslims. This is particularly the case in conflicts between strict Sunni sects such as Wahhabism and the Shiite tradition, which allows for the depiction and veneration of Muslim saints. Wahhabist authorities of Mecca have also engaged in the destruction of historic buildings which they feared were or would become the subject of "idolatry." Some Muslim groups have on occasion committed acts of iconoclasm against the devotional images of other religions. A recent example of this is the 2001 destruction of frescoes and the monumental statues of the Buddha at Bamiyan by the radical Muslim sect and nationalist group, the Taliban. 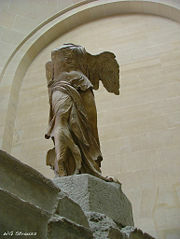 Similar acts of iconoclasm occurred in parts of north Africa. In India, a number of former Buddhist monasteries and Hindu temples were conquered and rebuilt as mosques. In recent years, right-wing Hindu nationalists have torn down some of these mosques, such as the famous Babri Masjid, and attempted to replace them with Hindu temples. Defaced statues in the Cathedral of Saint Martin, Utrecht, attacked in Reformation iconoclasm in the sixteenth century. Prior to the Reformation itself, iconoclasm was sometimes a part of various proto-Protestant revolts against ecclesiastical wealth and corruption. Churches were sometimes defaced in the process, and icons, crosses, and reliquaries removed or destroyed, often as much for the valuable gold, silver, and jewels which framed them, as for any theological motive. Some of the Protestant reformers, in particular Andreas Karlstadt, Huldrych Zwingli, and John Calvin, encouraged the removal of religious images by invoking the Ten Commandments' prohibition of idolatry and the manufacture of graven images. As a result, statues and images were damaged in spontaneous individual attacks as well as unauthorized iconoclastic mob actions. However, in most cases, images were removed in an orderly manner by civil authorities in the newly reformed cities and territories of Europe. Significant iconoclastic riots took place in Zürich (in 1523), Copenhagen (1530), Münster (1534), Geneva (1535), Augsburg (1537), and Scotland (1559). The Seventeen Provinces (now the Netherlands, Belgium, and parts of Northern France) were struck by a large wave of Protestant iconoclasm in the summer of 1566 known as the Beeldenstorm. This included such acts as the destruction of the statuary of the Monastery of Saint Lawrence in Steenvoorde and the sacking of the Monastery of Saint Anthony. The Beeldenstorm marked the start of the Eighty Years' War against the Spanish forces and the Catholic Church. What beating down of walls! What tearing up of monuments! What pulling down of seats! What wresting out of irons and brass from the windows!… What tooting and piping upon organ pipes! And what a hideous triumph in the market-place before all the country, when all the mangled organ pipes, vestments… together with the leaden cross which had newly been sawn down… and the service-books and singing books that could be carried to the fire in the public market-place were heaped together. We brake down about a hundred superstitious pictures; and seven fryers [sic] hugging a nun; and the picture of God, and Christ; and divers others very superstitious. And 200 had been broke down afore I came. We took away 2 popish inscriptions with Ora pro nobis and we beat down a great stone cross on the top of the church (Haverhill, Suffolk, January 6, 1644). Iconoclasm was also a hallmark of the secularist movements such as the French Revolution and the Communist revolutions of Russia and China. During the French Revolution, anti-royalist and anti-Catholic mobs often vented their anger against Catholic shrines, in the process destroying both religious art and statues and paintings of kings. The Pochaev Lavra of the Ukraine was turned into a museum of atheism during the Soviet era, avoiding the fate of other religious buildings which were often ransacked and irretrievably altered for secular use. During and after the Russian Revolution, Communist authorities encouraged the widespread destruction of religious imagery, which they considered a key means of perpetuating "bourgeois ideology" preventing the masses of people from adopting the socialist values of the state. During and after the Communist takeover of China, churches became the target of attacks against "western imperialism," and Buddhist or other religious shrines were destroyed as remnants of the old order. During the Cultural Revolution, Maoist mobs engaged in widespread destruction of religious and secular imagery in both Han and Tibetan areas of China. In North Korea, following China's lead, even crosses and icons in private homes, as well as Buddhist or other religious shrines, were banned and replaced with iconic portraits of Kim Il Sung. The capital of Pyongyang, previously known as the "Jerusalem of the East," became devoid of churches until recent years, when the government established a single official church, to which western tourists are often invited. In a broader sense, and iconoclast is a person who challenges supposed "common knowledge" or traditional institutions as being based on error or superstition. In this, Albert Einstein was an iconoclast for challenging Newtonian physics in the early twentieth century, and Martin Luther King, Jr. was an iconoclast for criticizing segregation in the southern United States in the 1950s and 60s, even though neither of them attacked physical icons. By the same token, those who support a return to segregation today might be termed iconoclasts, since racial integration has now become the prevailing political policy. The term may be applied to those who challenge the prevailing orthodoxy in any field, and an iconoclast in one group (for example a member of a conservative Christian congregation who publicly agrees with the theory of evolution) may not be an iconoclast in another context. ↑ G.R.D. King, "Islam, iconoclasm, and the declaration of doctrine," Bulletin of the School of Oriental and African Studies 48 (1985): 276-267. ↑ www.archive.org, 1885 edition of the diaries of the English puritan iconoclast William Dowsing on-line from Canadian libraries. Retrieved November 26, 2018. Besançon, Alain and Jane Marie Todd. The Forbidden Image: An Intellectual History of Iconoclasm. Chicago: University of Chicago Press, 2000. ISBN 978-0226044132. Eire, Carlos M. N. War against the Idols: The Reformation of Worship from Erasmus to Calvin. Cambridge [Cambridgeshire]: Cambridge University Press, 1986. ISBN 978-0521306850. Julius, Anthony. Idolizing Pictures: Idolatry, Iconoclasm, and Jewish Art. New York: Thames & Hudson, 2001. ISBN 978-0500282625. Martin, Edward James. A History of the Iconoclastic Controversy. New York: AMS Press, 1978. ISBN 978-0404161170. Pelikan, Jaroslav. Imago Dei: The Byzantine Apologia for Icons. Princeton, NJ: Princeton University Press, 1990. ISBN 978-0691099705. Spraggon, Julie. Puritan Iconoclasm During the English Civil War. Woodbridge, Suffolk, UK: Boydell Press, 2003. ISBN 978-0851158952. All links retrieved November 26, 2018. This page was last modified on 26 November 2018, at 17:18.